I guess you are already aware of the fact that Korean has the so-called counting units when counting (of course) things and people. There are tons of them unfortunately and it’s a hassle to memorize them all. That’s why many Korean language learners settle on using ‘개’ which, though understandable, is not right all the time. 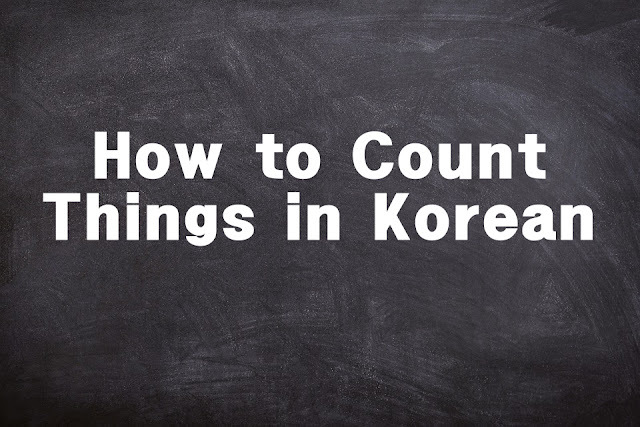 So take a look at this short list of counting units and speak Korean like you never did before. 벌 is the counting unit for clothes as in 셔츠 한 벌, 교복 두 벌, and 드레스 세 벌. 선물로 드레스 한 벌을 받았다. I got a dress for a gift. 켤레 is the counting unit for sock and shoes as in 양말 다섯 컬레 and 신발 세 컬레. How many pairs of shoes do you need? 잔 is the counting unit for a glass of drink as in 소주 한 잔 (a popular ballad song), 우유 두 잔, and 쥬스 다섯 잔.
Let’s have a glass of soju! 병 is the counting unit for a bottle of drink as in 콜라 한 병, 맥주 열 병, and 물 네 병. 바닷가에서 맥주 한 병을 봤어. I saw a bottle of beer at the beach. 장 is the counting unit for paper, stamp, and postcard as in 종이 한 장, 유표 아홉 장, and 엽서 여섯 장. Please give me a piece of paper. 대 is the counting unit for machines or riding stuff as in 폰 한 대, 차 세 대, and 자전거 일곱 대. 우리 가족은 차 3대만 있다니까. I told you our family only has three cars. 권 is the counting unit for books, notebooks, and the likes as in 책 일곱 권 and 공책 두 권. 도서관에서 책 몇 권을 빌렸어? How many books did you borrow at the library?